SETH’S PICK :: HAWKEYE #11: I’ve long extolled the virtues of Matt Fraction and David Aja’s Hawkeye on this blog, in the store, and just about anywhere else I get the chance. If any of you caught the Hawkeye panel at HeroesCon, you probably saw why I (and so many others) enjoy this book. There’s something unabashedly joyous about how these two creators continue to push each other’s creativity. That iron-sharpens-iron mentality is on full display in this week’s issue #11. [Here’s a condensed version of all you need to know to appreciate this issue. Hawkeye is about the avenging archer Clint Barton on his days off, when he’s away from his world-saving exploits. In the first issue, Clint fed a dog some pizza. That dog later saved his life, and was nearly killed in the process. Clint then saves the dog’s life, and adopts him. The dog’s collar showed that his name was Arrow, but Clint thought that was a little hokey, so he changed it to Lucky. Still, Clint and just about everyone else know Lucky as Pizza Dog.] Getting back to that display of creativity that I alluded to earlier, this issue is told entirely from the perspective of Pizza Dog. That means all the language in the book will be seen as a dog hears it, with only words he commonly hears highlighted. This issue also deals more with scent thanks to Pizza Dog’s status as – you know – a dog. 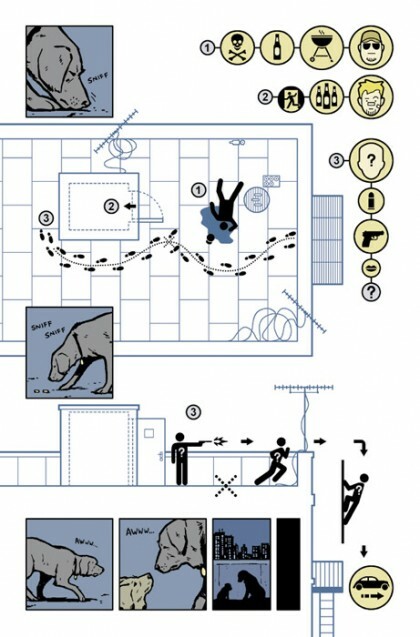 All these things alone should pique your interest for this particular issue, but even more, David Aja’s work on this one suggests he not only read Chris Ware’s acclaimed Building Stories, but decided to channel it into a Marvel comic. Needless to say, this is not only entertaining, but maybe even a little envelope-pushing. With storytelling like this, it’s no wonder Hawkeye received 5 Eisner Award nominations this year. I’m betting they’ll bring at least a couple home.